Fans of jazz music have plenty to look forward to next week. 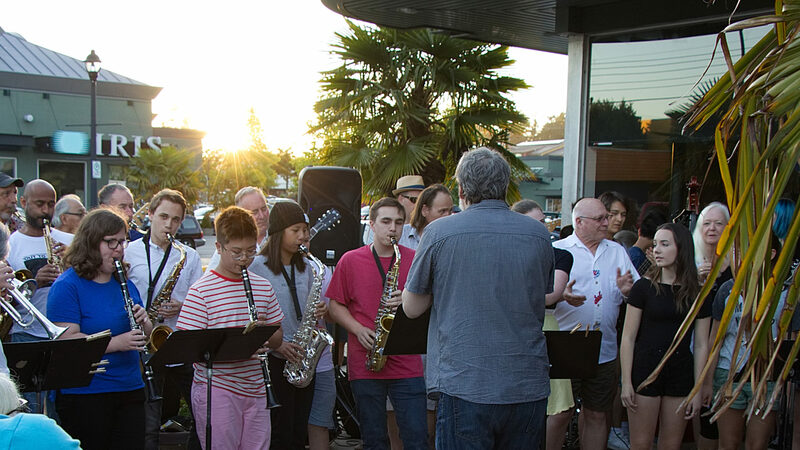 The sixth annual South Delta Jazz Workshop and Festival, featuring a range of lunchtime and evening performances, runs from Tuesday to Saturday in Ladner and Tsawwassen. South Delta Jazz Festival co-founder Jared Burrows (above) will all perform next week. Burrows, a guitarist and Delta Community Music School faculty member, will be performing with the Dave Branter Quartet on Friday at the Tsawwassen Arts Centre, one of the event’s two evening shows. “Dave was a person I looked up to as a musician when I was a teenager,” says Burrows, adding that Branter is well known as a teacher and large ensemble conductor. Branter is the department head at the Vancouver Community College School of Music and has directed, co-directed or co-produced four CDs with the Pacific Symphonic Wind Ensemble, a group he formerly directed. He’s performed with the CBC Jazz Orchestra, the Alan Matheson Nonet and the Colin MacDonald Pocket Orchestra. Branter has also played lead alto sax in Burrows’ big band, the East Van Jazz Orchestra. “In my mind, he’s one of the most exciting saxophone players around,” Burrow says. The second evening show will feature vocalist Steve Maddock and pianist Lorne Kellett performing with workshop faculty members Rob Kohler on bass and Stan Taylor on drums. Maddock, who has been a soloist with the Vancouver Symphony Orchestra, Vancouver Chamber Choir and the Dal Richards Jazz Orchestra, was at the South Delta event two years ago. Tickets for both evening concerts, which are sponsored by the B.C. Arts Council, are available at South Coast Casuals in Ladner Village. Tickets cost $10. Both shows are set for 7:30 p.m. at the Tsawwassen Arts Centre. Aside from Maddock, the other guest artists — Branter, trumpet player Chris Davis and saxophonist John Doheny — are newcomers to the event. “I think audiences like to know some of the people on stage but I think it’s important to have some variety,” says Burrows, noting the workshop faculty members are all returning artists. Students taking part in the five-day jazz workshop will get a chance to perform jazz standards and original compositions for the public Saturday at Delta Hospital from noon to 3 p.m.
Tuesday, July 7 at noon — Chris Davis at the Ladner Community Centre. Wednesday, July 8 at noon — Workshop faculty band at the McKee Seniors’ Recreation Centre. Thursday, July 9 at noon — John Doheny at the McKee Seniors’ Recreation Centre. Thursday, July 9 from 7 to 10 p.m. — Jazz Jam at Petra’s Arts Kafe. Friday, July 10 at noon — Workshop faculty band at the Ladner Community Centre. Friday, July 10 at 7:30 p.m. — Dave Branter Quartet at the Tsawwassen Arts Centre. Saturday, July 11 from noon to 3 p.m. — Student ensembles at Delta Hospital. Saturday, July 11 at 7:30 p.m. — Steve Maddock in concert with Lorne Kellett at the Tsawwassen Arts Centre.